Offering a waterfront locale relaxing hot tub and a free continental breakfast the Edgewater Inn Coos Bay offers all you need on the Oregon Coast. Each of this two-story hotel's 83 rooms has Wi-Fi expanded cable TV a coffeemaker microwave refrigerator and recliner; some rooms offer kitchens or jetted tubs and non-smoking rooms are available. Enjoy the free continental breakfast each morning and maintain your exercise routine in the gym. You can keep up with work in the business center or make a splash in the indoor pool and hot tub. 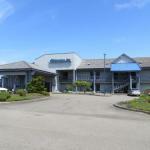 Pets are welcome and parking is free.Located on the bay one block off Highway 101 the Edgewater Inn is one mile from attractions such as the Coos Art Museum Coos Bay Boardwalk and the sea plane dock. Take in ocean views from Shore Acres State Park or tee off at Bandon Dunes Golf Resort; both are a half-hour away. Oregon Dunes National Recreation Area is 50 minutes north. Southwest Oregon Regional Airport is five-and-a-half miles away.